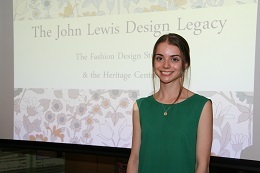 Camilla Honey explained to a sell-out audience at the John Lewis Heritage Centre that she was responsible for the design and creation of the Heirloom children’s clothes collection on sale at John Lewis stores. Heirloom is a premium range aimed at 4 to 14 year olds, both boys and girls, and inspired by archive materials. As a member of the JLP creative team in London Victoria, she explained that she makes regular visits to the Heritage Centre to harvest samples and ideas. The sample materials are then re-worked either digitally or on occasion by completely re-drawing and elements are modified and colourways changed. This process creates new, fresh and contemporary designs suitable for the latest fashion styles. Occasionally, she added, in the adult range, the sample for the Heritage Centre has such originality and such a story to tell that the creases, annotations, even stains from tea cups can be left in the design that is used to create the final material! Camilla’s talk was so interesting and stimulating that the audience followed the presentation with 45 minutes of questions. It was a fascinating insight into the creative processes that lead to successful modern designs and successful outfits.